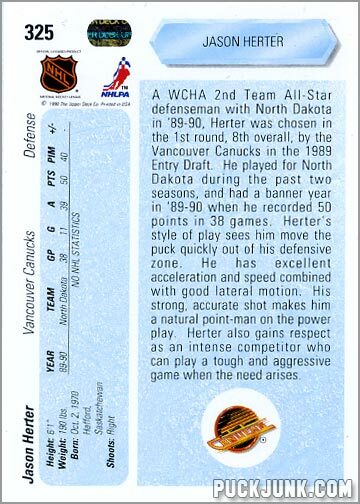 A WCHA 2nd Team All-Star defenseman with North Dakota in ’89-90, Herter was chosen in the 1st round, 8th overall by the Vancouver Canucks in the 1989 Entry Draft. 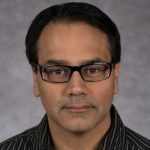 He played for North Dakota during the past two seasons, and had a banner year in ’89-90 when he recorded 50 points in 38 games. Herter’s style of play seems him move the puck quickly out of his defensive zone. He has excellent acceleration and speed combined with good lateral motion. His strong, accurate shot makes him a natural point-man on the power play. Herter also gains respect as an intense competitor who can play a tough and aggressive game when the need arises. 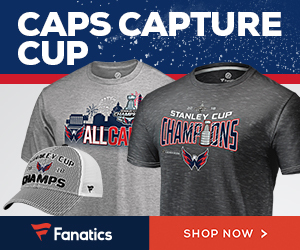 Unfortunately, it seems that his excellent acceleration was not excellent enough; likewise, his accurate shot was not accurate enough, at least by NHL standards. 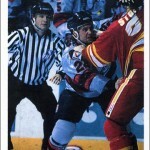 After the 1990-91 season – his last in collegiate hockey – Herter would spend the next five years in the minor leagues. 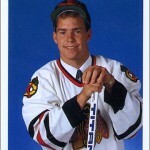 He did not once make the Canucks roster, and ended up being traded to the New York Islanders. During the 1995-96 campaign, he would get his shot in the NHL – a single game for the Islanders. He would earn an assist in that game. After two more seasons in the minors, Herter would play the next four in Germany before retiring from pro hockey in 2002. All in all, a First Round bust. But that is why they are called “prospects”, and not “sure things”. However, a few things make this Jason Herter trading card notable. 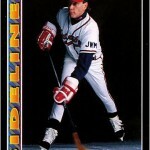 First, Herter’s one game was during the 1995-96 season – five years after this card was issued. It seems odd that a guy would get a card, and then play in the NHL – albeit one game – five seasons later. That might be a record for longest time between appearing on an NHL card and actually playing in an NHL game. Well, it would probably be a record if there were records for such things. This brings us to the second interesting note about this card – it came from a time when you didn’t have to play in the NHL to get featured on an NHL trading card. For the longest time, a player usually would have to appear in the NHL for at least one season before “earning” an NHL card*. 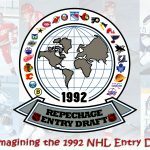 That changed in 1990, where card companies then decided to make cards of not only current players, but of draft picks as well – guys who had yet to play in an actual NHL game. Since these future players were not yet a part of the NHL Players’ Association, the card companies had to work out separate deals with each draft pick in order to feature them on a card. 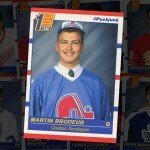 Sometimes, these draft picks would make more money to appear in a set of NHL cards than the NHL players themselves. 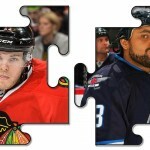 This became a sore spot for NHL Players Association. 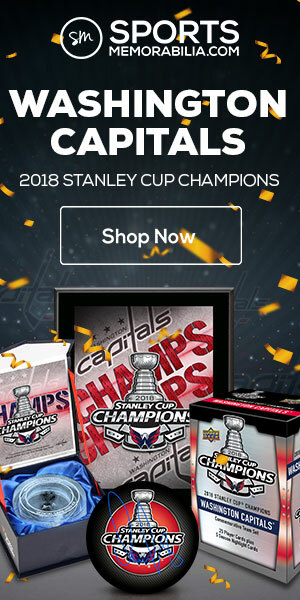 Why should prospects – guys who are unproven and not in the NHL – get paid, sometimes more, to appear on an NHL card than the NHL players themselves? Surely this did not seem fair. Eventually, the agreement was changed between the Players’ Association and the card companies so that a new player had to actually play in one game before appearing on an NHL card. 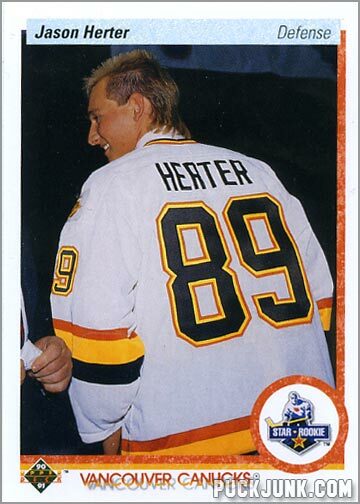 Finally, you may recall earlier that I mentioned that Herter was technically not supposed to have an NHL trading card. The reason for this, at the time, had to do with his amateur status. Herter was a college hockey player when this card was issued, and under collegiate rules was not supposed to have a hockey card made of him while still an amateur. I guess it goes against the whole amateur ideology if you are playing college hockey and somehow making money as a hockey player – even if it’s not payment for playing. But what was done was done. Even though the NHL career never happened, the trading card still did. * O-Pee-Chee – and some Topps sets from the late 1960s and early 1970s did in fact release some cards of players before they competed in a full season. Usually, these were exceptional and well-touted athletes. Guy Lafleur and Marcel Dionne entered the NHL in 1971, and both had rookie cards issued the same year. Likewise, Bobby Orr – who debuted in the 1966-67 season – had a card in the 1966-67 Topps set. Last week, I wrote about a Tony Esposito rookie card that was also issued during his rookie year.